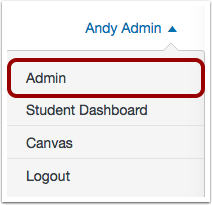 As a Catalog admin, you can create a course listing in Canvas Catalog using any existing course in your Canvas account. Note: Catalog course listings are linked to their associated Canvas courses. If you want to add a course that is not yet created in Canvas, you must create the Canvas course before you can create the course listing. In the Listings page, click the Add Course button. In the search field, search for the name of a Canvas course. Note: Catalog course listings are linked to their associated Canvas courses. 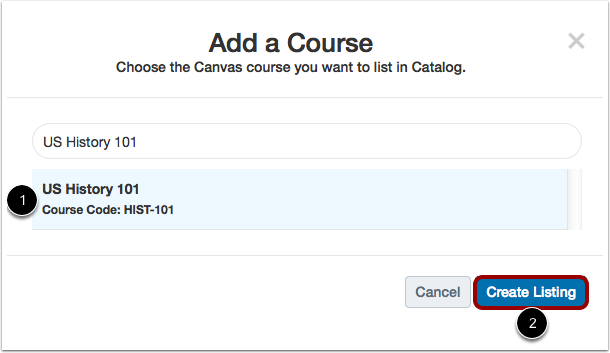 If you want to add a course that is not yet created in Canvas, you must add the Canvas course before you can create the course listing. To add a course, click the course name , then click the Create Listing button . By default, the course is not open for enrollment. To enable students to register for the course, toggle the Open for enrollment button. You can set an enrollment cap for your course. In the Cap field , enter the maximum number of students who can enroll in the course. By default, there is no cap limit. If you want to enable a wait list for your enrollment cap, toggle the Wait List button . By default, wait listing is not enabled. Learn more about enrollment caps and wait lists. In the Visibility section, click the icon for the visibility level you want for the course in the catalog. By default, the course listing is hidden in the catalog . You can change the visibility to Show listing in Catalog  or Accessible via direct link only . If you want to set a time-limited course section for each new enrollment, enter the number of days that the course will be available to the student in the text field. Otherwise, you can leave this section blank. The countdown begins for a student the day a student enrolls in the course. When you add a Canvas course as a catalog listing, the name of the course is automatically populated for you. If necessary, you can modify the listing title in the text field. If you want to add a number of credits a student can receive by taking the course, enter a number in the Credit Amount field. You can enter whole numbers or decimal numbers (e.g., 3.25). Note: If you add this course to a program, programs display the cumulative number of credits for all courses added to the program. Select the catalog that you want to associate with the listing. You can choose from your domain catalog or a custom subcatalog (path URL). If you want to set an enrollment fee for the course, enter a price in the Enrollment Fee text field. By default, enrollment is 0.00. The Listing Path  is the name of the listing added to the end of the catalog URL, e.g. [domain URL]/courses/[listing path]. The listing path will be generated for you based on the Canvas course code. If necessary, you can modify the listing path in the text field. Listing paths should be unique per catalog account and support lowercase letters, numbers, and dashes. The List Order  is the order the course should appear in the catalog listings. If not specified, the course will have no priority list order. If the course contains sections, select the section where new students should be enrolled. If the course does not contain sections, students will be added to the default section. Note: If you add new sections to your course or otherwise want to change the enrollment section, you will have to edit your catalog course listing at a later date. Changing a section in the Canvas course does not automatically apply to the catalog listing until you edit the listing. If listing SKUs have been enabled in your account, you can manually add an SKU to the listing. 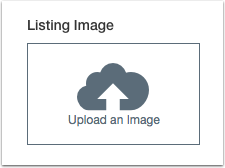 Select an image for your listing by clicking the Upload an Image button. 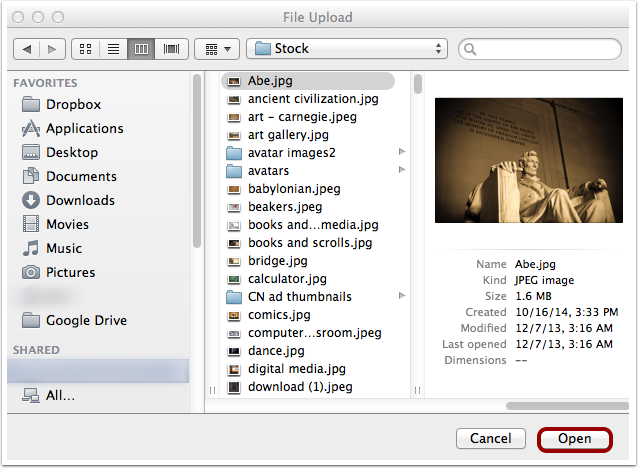 To locate an image on your computer, click the Browse button. Listings support PNG, JPG, GIF, and SVG images that are 768 pixels high and 1050 pixels wide. Locate an image on your computer. Depending on your browser, click the Choose or Open button. 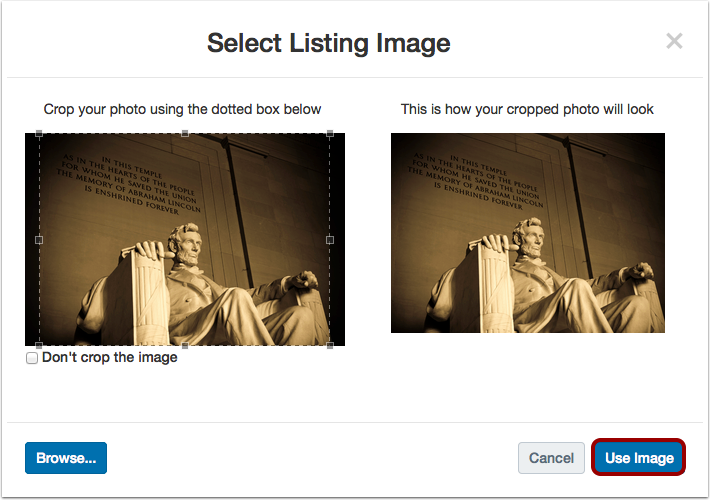 You can crop your photo by changing the size of the bounding box in the left image. The right image shows how your photo will appear in your listing. Click the Use Image button. Add text to the listing's Teaser  and Full Description  fields. Teaser is a brief paragraph summarizing the course and appears with the listing on the catalog page. In the sample listing in the sidebar, you can see how the text will appear in the listing as you type. The teaser field cuts off from view in the listing at approximately 280 characters, though the text field supports up to 1000 characters. Full Description is a full description of the course listing. The content editor allows you to format text, create lists, indent content, and insert links and images. The editor also supports editing HTML content. There is no character limit for the full description. In the Tags field, you can add tags to your listing for enhanced Catalog searching. To add a tag, type the name of the tag . If a tag already exists in your account, select the name of the tag when it appears. Click the Add button . Added tags appear below the Tags field. To remove a tag, click the tag's Remove icon . In the page header, click the Save button. Confirm your course was added successfully. Note: Catalog will notify you if there are errors in your listing. If there are any course errors, correct them and then click the Save button again. Once you have saved your listing, you can click the Copy URL button to copy the URL for the listing. Note: If the listing visibility is set to hidden, you will not be able to view the listing URL. Previous Topic:How do I manage catalog listings? Next Topic:How do I add a catalog program listing? Table of Contents > Admins - Catalog > How do I add a catalog course listing? Our registration team collects registration from a client in .csv form. The registration team uploads the participants to Catalog. Participants receive an invitation containing the direct link to the course. Considering the Days to Complete feature, the countdown begins for a student the day a student enrolls in the course. Does "enroll" mean the day the registration team enters the data and sends the invite? Does "enroll" mean when the student follows the direct link to access the course, completes the user defined information, and clicks Enroll in Course button? Keeping in mind there is a separate email chain which indicates Complete Registration. Does "enroll" mean when the participant has completed all aspects of the enrollment and registration process? I am asking for clarification because there may be a week or more before the participant follows the direct link to the course. In addition, some participants do not Complete Registration because they are under the assumption they already registered (i.e. paid fees) with the primary client. At which participant click does the countdown of Days To Complete begin? Re: Is there a limit to the size of the image we can use in Catalog for our course listings?